The Tektronix Type 82 is a dual-trace plug-in for the 580-series scopes. The Type 82 combined with a 585 or 585A provides a 4 nanosecond risetime (85 MHz bandwidth). The front end of the Type 82 is a 7586 nuvistor cathode-follower, followed by bipolar diff-amps and diode channel switching, followed by a distributed output amplifier made of three 6DJ8 tubes, with differential 93 Ω outputs. The use of a distributed amplifier in a plug-in is unusual. 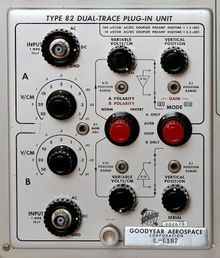 Note that the 58x series differs from 500-series scopes mainly in that the vertical signal interface between the plug-in and the mainframe is a low controlled impedance (93 ohms), as opposed to other 500-series scopes that present a high impedance to the plug-in. If you feed [a fast risetime] signal into an early type 82, you will find that the top three least sensitive positions have really terrible frequency response ... so bad, in fact, that some customers thought they were broken. When told this was normal, these customers wondered why Tek ever included them on the plugin. The answer was that they were still useful for low frequency signals ... but Tek never really made it well known that these 82 attenuator positions were lousey. I think this was fixed on the later 82's as Tek learned how to make better attenuators. If you have an early 82 and need to look at high frequency signals on the less sensitive ranges, the answer is to get ×100 probes and use them on the more sensitive ranges where the frequency response is better. The P6008 voltage probe was designed for use with the Type 82. The 585 manual warns that for proper performance with the 82 and higher-numbered plug-ins, 585 non-A scopes with serial numbers before 2585 should have the back termination of the final distributed amplifier output modified to the later circuit. This page was last edited on 25 February 2019, at 04:18.